The final report of the Access to Protection: A Human Right Project was launched on 6th December. These issues all resound loudly with incidents involving Malta over the summer of 2013. However these were not the only instances where refoulement was an issue for Malta. Other cases include the return of Eritreans in 2002 and a return of 6 individuals to Libya in 2004. 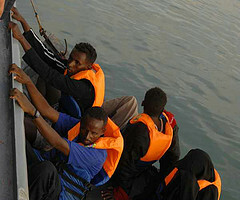 In 2010, a group of rescued migrants were arbitrarily split between Malta and Libya, with half being returned to Libya. The international law principle of non-refoulement, also enshrined in Maltese law, prevents the return of individuals to countries like Libya irrespective of whether the intervention of the State is one of interception or rescue, and irrespective of whether the activity is carried out by an official vessel or by the State giving instructions to a private rescuing vessel to return migrants to Libya. Consistently respect the principle of non-refoulement, as applicable regardless of the classification of the particular act, in line with Malta’s international legal obligations. Ensure that the saving lives at sea is always the first and main priority of any interception or rescue mission, and that persons rescued are not returned to a place where they might face human rights violations including torture and cruel and inhumane treatment and punishment. Clarify that ‘a place of safety’ refers not only to the physical safety of the individual but must also be such a place where his/her human rights are protected and there is an effective opportunity to seek international protection. Raise awareness amongst its various branches, including those directly involved in immigration control of the various legal and policy implications of the Hirsi judgments including the positive obligations it identifies. Ensure that respect for human rights, including the rights of non-nationals, is a priority in its negotiations with the Libyan government and authorities. Ensure any designation of a specific place of safety as the location of disembarkation be coupled with solidarity measures in place in order to assist the State of disembarkation in the attendant responsibilities which consequently become incumbent upon it. Ensure that any legal and policy developments at European level abide by the principles set out in the Hirsi judgment and fully respect human rights. Ensure that its own agencies, including Frontex, do not engage in actions in violation of the principle of non-refoulement, and that European Union funds are not utilized to support measures that contravene States’ obligations in this regard. Encourage the development of solidarity arrangements between various EU Member States in terms of the disembarkation of persons rescued at sea. Ensure that human rights considerations are a primary focus of any negotiations with third countries in the context of migration management. This report presents the final results of the ‘Access to Asylum: A Human Right’ Project in Malta. It builds on the research carried out by the People for Change Foundation over the course of the past 12 months including legal analysis, desk research and a round table discussion with various stakeholders held in May 2013. The research comes at a time when issues of access to the territory and to protection could not be more prominent, especially when one notes the incidents that took place over the summer of 2013. The primary argument throughout this report is that the principle of non-refoulment applies irrespective of the classification of the act in question, including whether it is an interception or a rescue operation, and whether it is carried out by official vessels or by private vessels coordinated by the State. An analysis of the Salamis incident clearly highlights that Malta (and Italy in this case) cannot evade their non-refoulement obligations by instructing rescuing vessels to return rescuees to places of disembarkation to which their own official vessels are precluded from disembarking. Any such actions would amount to de facto refoulement and would be in violation of their obligations under International Law. The report also identifies a number of challenges in the international law framework surrounding maritime migration. Most notably, it highlights that while it is clear that priority must at all times be given to disembarkation, the SAR Convention regime does not effectively designate a default State of disembarkation. These challenges cannot, however, justify the return of individuals to countries where they face persecution or any form of inhuman or degrading treatment or punishment. This report is organized as follows: Chapter 2 presents the salient legal principles from the Hirsi judgment including its direct relevance for Malta. Chapter 3 applies these principles to the Maltese context. First, it presents Malta’s legal framework and context in this regard. It then moves on to present some of the more important cases in which Malta has been involved including the return of Eritreans in 2002, returns to Libya in 2004 and the incidents from summer 2013. Chapter 4 discusses some of the obligations relating to the principle of non-refoulement including the right to be informed of the right to seek asylum and to be assisted by a lawyer. Chapter 5 delves into some of the legal issues arising from the MV Salamis incident, discussing these within the context of the Hirsi judgment and international law more broadly. Chapter 6 concludes by making a number of recommendations. The launch of the report was covered by various media outlets including: Times of Malta, Di-ve.com, the Malta Independent, MaltaToday, inewsmalta. Read the Press Release here or visit our Press Page. Since 2012 The People for Change Foundation has been implementing the Access to Asylum: A Human Right! Project in Malta. The issue of access to protection including the issue of human rights at the external borders is particularly relevant for Malta as an EU border State. The overall objective of the project is to bring national/EU policies and practices in line with the obligations set out by the European instruments on Human Rights and in particular by the Strasbourg Court in the Hirsi case, as far as the access to the territory and to protection is concerned. The project aims at reaching a “cultural change”, characterized by a shift from a vision mainly focused on security and on combatting irregular immigration flows to an approach which can balance these exigencies with the respect of human rights, in particular the principle of non-refoulement and the access to protection, through the adoption, if it is necessary, of specific amendments to the national and European legislation, policies and practice. The project intends to promote an enhancement of practices at the borders and to the control of frontiers. Moreover, the project has the purpose of fostering the full access of the UNHCR and other organizations to potential international protection seekers, and of promoting a systematic training on human rights and refugee law, addressed to authorities, in particular border guards. Dissemination of results and findings and lobbying with recommendations. The project is coordinated by the Consiglio Italiano Per I Rifugiati. The partnership includes: the Hungarian Helsinki Committee (Hungary), Pro-Asyl Foundation (Germany), The People for Change Foundation (Malta), the Greek Council for Refugees (Greece), and the Spanish Commission for Refugee Aid - CEAR (Spain) and The Portuguese Council for Refugees. The partnership has also benefitted from the valuable support of the Bureau for Europe - Division International Protection of the UNHCR, the Commission for Migration, Refugees and Displaced Persons of the Parliamentary Assembly of the Council of Europe and the lawyers of the Forensic Union for the Protection of Human Rights, who filed the complain concerning the Hirsi case before the European Court of Human Rights. For further information about the project, including the project outputs contact us on: info@pfcmalta.org. December 2012: Working Paper - Hirsi Jamaa and Other v Italy: Where does Malta Stand? On May 23rd 2013 The People for Change Foundation hosted an expert roundtable on access to asylum as part of this project. You may view the Concept Note from the meeting here. Want to stay updated? Subscribe to our mailing list!